Please Look after Mom is the story of a family left bereft after the disappearance of their wife/mother. Each section of the book is told from a different family member’s point of view. Mom’s disappearance triggers forgotten memories and feelings of guilt as they all begin to wonder how well they really knew their mother/wife. None of them had ever really considered their mother’s thoughts, dreams, happiness or feelings before her disappearance. They all took her for granted and regret not knowing her better. They blame themselves for her disappearance, naming the things they should have done differently. Her husband feels completely isolated and alone in his home without his wife. He is angry with himself because all he did was ask her to do things for him or blame her for everything or ignore her completely. He surprisingly finds that, “Your wife, who you’d forgotten about for fifty years, was present in your heart. Only after she disappeared did she come to you tangibly, as if you could reach out and touch her.” “Why didn’t you know you had a peaceful and lucky life? How could you have taken what your wife did for granted?” He doesn’t’ know how to do anything because she waited on him his whole life and took care of everything herself. He is lost. The family had ignored their mother’s declining health condition for years. She had trouble remembering, was plagued with crippling headaches and sometimes couldn’t find her way home. In an odd way this brilliant book reminds me of Natsume Sōseki's 夏目漱石 (1867–1916) novel Kokoro こころ (1914). Natsume laments how much the Japanese lost in their mad rush to modernize during the Meiji period (1868–1912). Ms. Shin asks the same questions of Koreans a century later. Penitence is, after all, this book’s whole point. Characters’ eyes begin watering, pooling with tears, brimming over, etc., as each one has the chance to realize that Mom was a treasure. (Bonus sobbing cue: Nobody knew that Mom was secretly working at an orphanage in her spare time.) Mom’s children start to see how wrong it was to abandon ancestral traditions for their busy, newfangled, heartless, stressed-out city lives. An enormous publishing success in South Korea, this simple portrait of a family shocked into acknowledging the strength and heroic self-sacrifice of the woman at its center is both universal and socially specific. Since you heard about Mom's disappearance, you haven't been able to focus on a single thought, besieged by long-forgotten memories unexpectedly popping up. And the regret that always trailed each memory. The thing your wife said to you most frequently, ever since you met her when you were twenty, was to walk more slowly. How could you have not gone slower, when your wife asked you to slow down your entire lives? You'd stopped and waited for her, but you'd never walked next to her, conversing with her, as she wanted – not even once. Since your wife has gone missing, your heart feels as if it will explode every time you think about your fast gait. If I can't live like Mom, how could she have wanted to live like that? Why did this thought never occur to me when she was with us? Even though I'm her daughter, I had no idea, so how alone must she have felt with other people? How unfair is it that all she did was sacrifice everything for us, and she wasn't understood by anyone? One woman. That woman disappeared, bit by bit, having forgotten the joy of being born and her childhood and dreams, marrying before her first period and having five children and raising them. The woman who, at least when it came to her children, wasn't surprised or thrown off by anything. The woman whose life was marred with sacrifice until the day she went missing. "Please, please look after Mom." 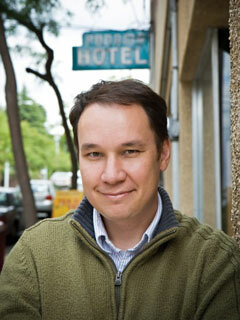 Jamie Ford is the New York Times bestselling author of Hotel on the Corner of Bitter and Sweet. Some books change us. They change the way we look at ourselves, the way we interact with those closest to our hearts--the way we’ve loved those people, or the way we’ve missed them or honored them or taken them hopelessly for granted. This is one of those books. This is a book that alters the way we remember. I’m an author, so this is where my own writerly fail-safes kick-in, warning of hype and hyperbole...but even in reflection...I’m not speaking falsely. Please Look After Mom isn’t merely a story of familial loss and longing, of the many veils of shame and surrender beneath one roof. This tale is a door, and once you cross its threshold, you’ll never be able to go back to that comfortable place you came from. Your perceptions will be transformed. Permanently. But as the four pillars of one family are shaken by this mysterious disappearance, we are also enriched as we learn about the wealth of emotional currency that has been exchanged over one lifetime--tender payments, and the debts owed, from children to parent, from husband to wife, from an aged mother to...herself. This book is four stories, four echoes, four promises, and four lamentations--that make a whole. This is your gentle warning, dear reader. And an invitation, to the kind of book I wish I could read again for the first time. Please Look After Mom is written in four distinct voices: a daughter, a son, a father, and finally “Mom” herself. Why did you decide to structure the novel in this way? Which voice came to you first? Human beings are multi-dimensional. But what we know about our mothers doesn’t always tell the whole story of who they are. I wanted to show a ‘Mom’ who was a complex and profound human being. As it was impossible to do this in a single person’s voice, I needed multiple narrators. In the novel, the voices of the daughter, son and father are narrated in the second person, “you” and the third person, “her”. It’s only the mother who uses the first person. I had in mind the fact that, when a woman becomes a mother, she no longer gets to speak or sometimes even think in terms of that “I”. Of the four different voices in the book, the mother’s is perhaps the most vivid and powerful. When I was writing it, it felt as though my mother’s hand had held—even gripped—my authorial hand, so that she could tell her own story. This is an extremely personal novel, and readers will undoubtedly think about their relationship with their own mothers while reading. Did you draw on your relationship with your own family while writing the book? My own family relationships do in fact make up the background, but the episodes in the novel were invented, or altered from reality. My own mother for example, thankfully, has never gone missing. But, speaking at a symbolic level, many mothers of our generation, I believe, have gone missing or remain neglected. Has your mother read this novel? If so, what did she think/say to you about it? That she was proud of me for having written it. In Please Look After Mom, you beautifully describe many elements of Korean culture—the Full Moon Harvest, the food, clothing, etc.—that most Americans may not be familiar with. Are there any traditions that you are particularly excited to share with readers here? The novel’s various aspects of Korean culture came up naturally as I was describing the everyday life of the ‘Mom’ character. The Chuseok holiday, or the Full Moon Harvest, in Korea is similar to Thanksgiving in America. On that day, family members all over the country return to their hometowns. In order to show gratitude to our ancestors, offerings are prepared from the season’s harvest. We also pay our respects at their gravesites. On a clear night, you can see the full moon on Chuseok. There’s a popular saying that translates roughly to, “May your life be as plentiful and full of joy as a Chuseok night.” It expresses the sentiment that the person’s life will be as bright as the full moon during the harvest festival. Last year, I got to spend my first American Thanksgiving in New York. I was invited to have dinner by a friend who’d been living in New York for a long time. Turkey was served, of course, and I had a wonderful time sharing the meal with my host’s family. Just as Americans celebrate the day over turkey, Koreans spend Chuseok sharing songpyeon, or half-moon shaped rice cakes, with their families. I was delighted by the similarities between the two holidays. Dining with someone, especially these days, isn’t simply a matter of sating one’s hunger—preparing a meal with someone and dining under the same roof is of course a way of connecting. You can drink tea with just anyone, but to dine with someone shows how close you are to that person. In my book, ‘Mom’ is always preparing warm meals, often to send them to family members living out in the city. I wanted food to play an important role in my book—a symbol of warmth that can’t be expressed with words. I wish I could prepare for my American readers the many Korean dishes that appear in Please Look After Mom, so that we could share them together! But, moving beyond food, Korea has a number of beautifully elegant Buddhist temples, such as Hwaeomsa, Pusoksa and Haeinsa, and seowon (a kind of Confucian academy) such as Dosanseowon and Byungsanseowon. These are sacred and quiet spaces, containing the spirit and culture of the country. You should definitely pay them a visit if you are ever in Korea. If you have an interest in music, try listening to pansori, Korean traditional music, which contains a different resonance than Western harmonics, and expresses a distinctly Korean sorrow and humor. Your novel is being published in many countries and people around the world are identifying with the characters you have depicted. What are some of the universal truths of the relationship between mothers and children that you explore in the novel? The line by Mom when she finds her mother’s soul (“Did Mom know? That I, too, needed her my entire life?”) expresses, I believe, a universal truth. When I’d written that sentence, I felt that the work was complete. We all need mothers, regardless of who we are. Even those who are currently mothers! One theme that runs throughout the novel is that of personal dreams versus sacrifice for family. Do you feel that this struggle is different for older and younger generations? You are now an extremely well-known and widely respected author in Korea. Has this fame dramatically changed your life, and your experience of being a writer? What kind of responses did the novel receive in Korea? I published my first work of fiction in a Korean literary journal at twenty-two. From age sixteen to thirty, I was always working. I went to high school at night and worked during the day for a company that made stereo systems. When I was in college, I would tutor children, write and do research for the school newspaper, and read to those who’d suddenly gone blind. Even after my first book was published, I worked all sorts of jobs, any really, that would allow me to write: an editor at a publishing house, a writer for a classical radio station or for magazines, etc. My experience at these jobs provided vivid material for when it came time to write. But it was when I was about to turn thirty, when I published my second book, that people began to really pay attention. It was totally unexpected. The book was a collection of nine stories, and within six-months after it was published, 300,000 copies had been sold. It was the first time that a short-story collection had done so well in Korea. Everyone was surprised. For the next twenty years, my readers have stayed with me for every book I published. Thanks to their support, I have been able to live a life of great freedom, and to devote all of my time to writing. This was a dramatic shift for me. Writing and my personal life became like two sides of the same coin. 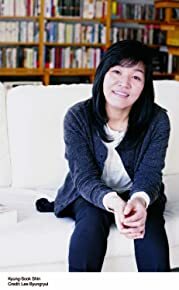 Whatever I was experiencing at a personal level in Korean society, I tried novelizing to the most truthful and powerful extent possible, and my readers seemed to actively engage with my work and sympathize with it. Even today, I write a little every day without being tied down to anything else. I only feel free when I’m writing, and the best way I know how to give back for this invaluable freedom is to write in a way that engages people—and will make readers curious about what the next work will be like! Although this is your first book to be published in English, you’ve written numerous other works of fiction. When did you first begin to write and what topics were you drawn to? I’m the product of my mother’s influence. My mother would look so happy when she saw me reading a book. I started out reading to bring more happiness to my mother, who always looked so tired. Even before I was ten, it was my dream to become a writer. I began writing fiction on my own when I was in high school. Of course, it was an exercise more than anything. I wrote in any form I wanted—stories, essays, poems—pieces where often, the beginning didn’t even fit with the end. I was a young girl who’d moved to Seoul from the countryside. I lied about my age to get a job at a company. Back then, South Korea was an industrial society and not yet a democracy, and there were disputes between the workers and the company, demonstrations almost every day. Hearing cries of protest from outside, I would lay out my notebook on the conveyor belt and write. Writing was what got me through those years; five years later, I formally made my debut as a writer. I wrote, wanting to produce a work that expressed human beauty and its almost magical strength even when confronted with the most tragic situations. I wanted, too, to write about respect and compassion for life. Now that I am older I have these same hopes. But I also hope that after they read my works, readers will be seized by the longing to remember and see again someone they’d forgotten, or some aspect of life they may have overlooked. Whenever I see people drowning in suffering and sadness, I feel a strong compulsion to return to my writing. I would like for my work to in a way play a maternal role, of standing by those who feel sorrow, whether it is of social or personal origin. Tell us more about your writing habits. When and where do you like to write? I like best to write from 3 in the morning till 9 in the morning. I like the feeling of writing in darkness and working myself, little by little, towards light. One of my habits as I write is that I often wash my hands in cold water. Is there a message that you hope readers take away from Please Look After Mom? I’ll point you to the novel’s epigraph, by Franz Liszt: “Love, so long as you can love.” And I’d hope you’d remember, and realize again the plain truth that your mother was not born that way, that she too had to become a mother. Taking the time to think about your mother might also mean taking the time to think about yourself. If anyone wants to call his or her mother after reading this book, it would please me very much. Lastly, you are living here in the U.S. this year, studying at Columbia. What have you enjoyed most about living in New York? I’m very much enjoying the tremendous variety of culture New York has to offer: MoMA, The Guggenheim, The Met, The Frick, The Morgan Library, The Whitney. I’m also visiting small galleries in Chelsea. I’ve been going to the opera, theater, musicals, the ballet and the cinema. I’m also trying all sorts of cuisines. Restaurants from all of the world seem to be gathered in New York. The beauty, spectacle and drama that echoes at the Metropolitan Opera, especially, is something you can’t get in Korea, so I have acquired season tickets. But, “culture” is everywhere here; the streets of Manhattan themselves feel like theater. When I’m strolling around, I always have the pleasure of finding something new that I didn’t notice the day before.